Иностранцев, отдыхающих в отелях Варадеро, кубинцы считают богатыми и достаточно обеспеченными, чтобы позволить себе дополнительные услуги. Поэтому, выбирая для отдыха недорогие отели Варадеро 3 звезды, важно помнить, что ассортимент блюд будет скромным. Особенно это касается мясных блюд, которых в недорогих отелях Варадеро часто нет или же мясные деликатесы могут подаваться непривычным способом. Зато в кубинском роме недостатка не будет. У тех, кто выбрал отели Варадеро 4 звезды "все включено" или 5 звезд, нет подобных проблем с питанием. Вам предложат хороший выбор блюд, опять же по кубинским меркам. На территории гостиницы могут встречаться ночной клуб, бары и другие развлечения для гостей. В отелях высокой категории стоит помнить о «поощрении» персонала за качественный сервис. В отеле Варадеро, если вы хотите, чтобы у вас убрали номер тщательнее, необходимо «поблагодарить» за это горничную. Получить в ресторане «спецобслуживание» можно также за вознаграждение. В целом ваш отдых будет приятным и веселым в отелях Варадеро любой категории, ведь солнце и океан смоют любые негативные эмоции, которые только могут возникнуть. Главное правило при выборе отеля Варадеро – выбирайте отель с самым высоким рейтингом и настолько высокой ценой, насколько позволяет бюджет. This charming hotel is situated in Matanzas, enjoying close proximity to a number of attractions in the area. Guests will find themselves just a few steps away from Plaza de la Libertad, bathed in the rich culture and charm of the historical centre of the city, The hotel welcomes guests with warm hospitality and excellent services, as well as the promise of a memorable stay. The guest rooms are tastefully appointed, reflecting classical style. The rooms feature modern amenities for added comfort and convenience. This heritage hotel enjoys a rich history, immersing guests in the refined elegance of a bygone era. The hotel affords a number of excellent facilities, meeting the needs of every type of traveller. Presenting an impressive mixture of individuality, quality, and an exquisite location beside the beach amidst untouched greenery, this hotel is an ideal choice for a family vacation and a romantic getaway. It is about 15 km to Marina Chapelin and approximately 28 km to Varadero airport. The elegant building is the tallest in Varadero, and comprises a total of 383 double rooms and twelve suites. The establishment offers excellent service, and amenities include a terrace, a selection of shops, and restaurants. The rooms offer views of the sea, and include an en-suite bathroom and air conditioning. Four wheelchair-accessible rooms are available, so that guests with disabilities will also feel at home in this charming residence. Grand Memories Sanctuary is an all inclusive, adults-only paradise that provides a unique selection of services and amenities to our guests. With Deluxe Suites, complimentary butler services, and around-the-clock room services, Sanctuary is a unique and stylish accommodation option for those searching for a more exclusive tropical getaway. This adults-only resort is a tranquil property that caters to guests over 18 years of age only. It features everything necessary to create a tranquil and relaxing moment to enjoy the comfort of a kids-free haven including an exclusive à la carte restaurant and bar, and a crystal clear, adults-only pool. Sanctuary is a hotel within a hotel and our guests may enjoy access to all of Grand Memories Varadero's restaurants, bars, activities, and health and wellness facilities. This luxurious club resort sits on the paradise-like Varadero Beach, in the tourist centre of Cuba. The resort lies close to the golf club, as well as the shopping centre and the Convenciones Plaza America. The hotel is located just 40 km away from Matanzas. A number of attractions can be found nearby, as well as a host of shopping, dining and entertainment opportunities. This hotel features elegantly-styled guest rooms and bungalows, which offer a high level of comfort. The hotel features an extensive range of recreational activities, ensuring that there is never a dull moment. Guests can indulge in the ultimate rejuvenation with an invigorating massage. This extensive complex comprises 5 restaurants and 5 bars, spoiling guests with a variety of dining options and cuisines. Royalton Hicacos Varadero Resort & Spa is an all inclusive, adults only beachfront hotel in Varadero. Has in its facilities a main pool with waterfalls and bridges, two small pools, four Jacuzzis, a solarium, sun beds and sports courts for tennis, squash, basketball and beach volleyball. It also has a sauna, outdoor theater, games room and provides equipment for water sports such as kayaking, sailing, snorkeling, windsurfing and catamaran. This adults-only hotel has a buffet restaurant food, three restaurants a la carte meal, two snacks, six bars located in different areas and a nightclub. Additionally it has a beauty salon and provides spa services, laundry, car rental and tour desk, with extra cost. Starfish Cuatro Palmas is located next to the Varadero beach, this all-inclusive resort set among tropical gardens, offers quality accommodation, pool, gym and a variety of fun activities for adults and children. Starfish Cuatro Palmas offer 160 rooms, you can choose a stunning sea view or a quiet view overlooking the patio. Be Live Las Morlas is a lovely All Inclusive hotel featuring 148 spacious and comfortable guestrooms spread over its four floors. Surrounded by lush vegetation, the property offers a pool, a stunning beach, four restaurants and bars, and other facilities, which include soccer and tennis courts. Let your kids have a blast taking part in the activities organized in the kids club, while you and your partner get some peace and quiet with a relaxing massage in the spa. Come and experience all you expect and more during a wonderful vacation at this incredible Varadero property. The resort is located in Varadero, at the Hicacos Peninsula in the Matanzas Province at Kilometre 11. This is the ideal place for the sun and beach lovers because it is located in a middle of a dazzling natural vegetation surrounded by 2 different beaches area: one private beach of one kilometer of extension limited by two picturesque mass of rock, in addition to, another excellent beach area. Each section has associated a swimming pool, what makes one of a kind establishment and an unique product in Varadero. At only 8 km from the town of Varadero, at 1 km from the commercial center “Plaza America” and at 37 Km of the International airport “Juan Gualberto Gomez”. Situated beside Varadero Beach, the resort is approximately 155 km from José Martí airport in Havana and some 30 km from Juan Gualberto Gómez airport in Varadero. This super-inclusive resort comes highly recommended to couples and those aged 16 years and over who wish to enjoy the most complete ‘all-inclusive' plan in the country. A total of 166 suites with separate living areas are spread over eleven 2-storeys villas and there are 98 junior suites and 6 tropical suites in a 3-storey building with lifts. The complex covers just under 11 hectares with several accommodation blocks offering paradisiacal privacy that is further enhanced by lavish tropical vegetation, in which trees alternate with exotic flowers. Amenities include a currency exchange bureau, a safe, a bar, a nightclub, a restaurant and a TV room. Board games, table tennis, billiards and computer games are on offer in the 24-hour games room. Furthermore, there are conference facilities to make use of and, on payment of additional fees, it is possible to gain access to the Internet. The room service and bicycle hire may be taken advantage of. All the suites and junior suites feature a private bathroom with a shower and hairdryer, a direct dial telephone, satellite TV, tea and coffee making facilities, ironing equipment, a hire safe, a double/ king-sized bed and a balcony or terrace. The air conditioning may be regulated individually. Luxurious hotel located on the shores of the Caribbean Sea, perfect for both couples and families. In addition, you can also stay under All Inclusive. All rooms are decorated in a modern style, with all the necessary services to make your stay a complete success. Among the hotel's general services, guests can enjoy a spa, which has all the necessary treatments for relaxation and disconnection; Direct access to the beach, and a large swimming pool. It is also possible to practice water sports in the vicinity, as well as celebrate small and large events in specially prepared spaces. Located on the north coast of Cuba, the family-friendly Iberostar Tainos All Inclusive hotel enjoys a wonderful position frontline to the turquoise waters of the Gulf of Mexico and the white sandy beach of Varadero, stretching for more than 22 km, and just a few steps away from the Bahía de Cardenas to the south. The town centre of Varadero is at a distance of about 18 km, while the city of Matanzas is about 54 km away. The pleasantly designed hotel building is decorated in the style of a Caribbean village, surrounded by lush tropical vegetation. Children will love the mini-club, the children's pool and the playground, while their parents and other guests will appreciate the wellness centre with sauna and massage. Numerous sports facilities invite to be active during the holidays; several restaurants serve various delicious dishes, including traditional Cuban Creole food. An ideal place for couples and families with children. The Iberostar Playa Alameda is in a prime position right on the beachfront of the stunning resort of Varadero, 17 km from the city centre on northwest coast of Cuba. This fabulous 5 Star all inclusive property is composed of 12 buildings surrounded by tropical gardens and offers 391 well equipped and spacious double rooms with modern amenities. Offering a luxury standard with tons of activities and opportunities to be pampered, guests to the Iberostar Playa Alameda are surrounded by soft white sand, turquoise waters and vibrant coral reefs and are totally indulged by the warm and friendly staff. Jose Marti International Airport in Havana is 150 km from the hotel and Varadero Airport is just 55 km away. La Habana 150 km Capital of Cuba with historic colonial city center national museum promenade Capitol harbour and great cultural offers of art galleries concerts and nightlife. This five-star resort is located in front of the idyllic Varadero beach, surrounded by extensive gardens that include the legendary 500-year-old Patriarca cactus. With a prime beachfront location and surrounded by the ecological reserve Varahicacos, it stands on one of the best sections of beach in Varadero. The hotel features exclusive rooms as well as a wide range of services including theme restaurants and a spa centre. Facilities on offered are currency exchange, boutique and medical centre. There are 2 swimming pools, 2 tennis courts and 2 multisport courts. Room service and laundry service and free private parking are available. This hotel combines tropical beauty with great services, making it the perfect setting for a romantic wedding and honeymoon or a fun-filled family holiday. In addition, the property is part of the Las Américas Resort complex and is situated near the Varadero golf club and about 35 km from Varadero airport. The air-conditioned hotel comprises a total of 608 accommodations, including 2 disability-friendly rooms. They all come with an en-suite bathroom, satellite/ cable TV and Internet connection. The air conditioning is individually adjustable, and guests can enjoy wonderful views over the sea, the swimming pool, or the lush gardens from their balcony or terrace. Countless recreation options are available on-site- from swimming pools for both children and adults, to massage service and sport activities. Melia Las Antillas All Inclusive resort (Adults Only) is located on the seafront at Varadero beach, next to the dolphinarium. The resort is surrounded by exotic Caribbean hanging gardens, water features, lush vegetation and sports facilities. It also has spacious and comfortable rooms and a variety of gourmet meals. It is recommended for adults over 16 years old, couples, weddings, honeymoons, singles and groups. This hotel enjoys a paradise location on the beaches of Varadero, on the northern coast of Cuba. It is less than 17 km from the city of Varadero and about 160 km from Cuba's capital Havana. The hotel is perfect for couples, families and groups thanks to the range of facilities on offer, including a bar, several restaurants, a nightclub, medical service and Internet corner. Guests are welcomed in the lobby with currency exchange. Other facilities include air conditioning, an auditorium, kids' club and bicycle hire. Ocean Vista Azul is a new 5 stars Resort, with an amazing view of the ocean, and a white-fine-beach with crystal and clear waters. The hotel offers modern and spacious rooms, a selection of a la carte restaurants, Despacio Beauty Centre and the Privilege Service. Exclusive Privilege Rooms and Services. The hotel also offers a wide range of entertainment for the whole family. This all-inclusive hotel is located in one of the prettiest holiday destinations, Varadero Beach. All tourist venues are easily accessible. In addition, Havana is 140 km away and it is 290 km to Trinidad. Guests may enjoy the comfort and luxury of this all-inclusive hotel. The air-conditioned property comprises a total of 490 rooms of which 483 are double rooms and 7 are suites. Amongst the facilities count dining and drink facilities, room service and car parking. There is also a playground for children. All of the rooms and suites are fully-equipped as standard including individually controlled air conditioning and a balcony. Leisure offerings include 2 outdoor pools and a Jacuzzi as well as massage treatments. There is also a variety of sport options available for guests. This exclusive, adults-only resort is surrounded by lush, verdant gardens and bordered by a fine, sandy beach and the crystal clear waters of the Caribbean Sea, making it ideal for a couples' retreat. It is situated on the Hicacos Peninsula, just outside of the popular resort town of Varadero.The spacious, attractive rooms come with air-conditioning, private en suite bathroom, and a balcony or terrace, while suites also feature a living room and sea views. Guests can wake up to a hot cup of coffee with in-room coffee makers, and enjoy international dishes and Caribbean fusion foods in the a la carte restaurant. The Cigar Bar offers live music in the evenings, while the pool bar serves fantastic, refreshing cocktails by the sparkling outdoor pool. Guests can spend sunny afternoons lounging on the resort's private beach and take advantage of 24-hour room service and butler service, all for a wonderful getaway. The hotel is just 10 minutes from the centre of Varadero and its many places of interest and dining opportunities. The beach resort consists of 434 rooms, with 74 attractive suites and 360 junior suites. Additional facilities include a café, a nightclub and a restaurant. It also offers function rooms, which are ideal for conferences, meetings and special occasions. All accommodation units offer spectacular scenic views and are equipped with all the essential amenities to ensure a memorable stay. Standard features are an en-suite bathroom, satellite/cable TV and air conditioning. In addition, rooms also come with a balcony or terrace from where guests can enjoy wonderful views. This up-scale resort boasts a fantastic location in one of the most appreciated areas in Varadero. The property enjoys a great position within a nature reserve and by the beach on the Rincón Francés zone. Guests will appreciate the beauty of the turquoise waters and the white sandy beach where they can sunbathe or practice a fun water sport. Other interesting nearby attractions include a golf course just 6 kilometres away and the peaceful and well-kept Josone Park. Those staying at this resort may choose between several accommodation options, ranging from romantic suites to spacious and formidable private villas. All of them are nicely decorated with charm and count with all the necessary amenities for a memorable stay. Among the wide range of extraordinary in-house facilities, visitors will be impressed with the wonderful swimming pools and the varied dining offer. This attractive resort hotel is set just 30 metres from the sandy beach and right next to the Varadero Golf Club. Apart from spending warm, sunny days lounging on the beach or by the sparkling outdoor pool, guests might enjoy a game of beach volleyball, take a Spanish language or tennis lesson, or rent a bicycle and go for a ride along the coast. Children will delight in the kid's club and children's swimming pool. Families might also make use of the games room offering billiards, board games, table tennis and shuffleboard. The cosy rooms are air-conditioned, en suite, and equipped with blackout drapes for those who prefer to dance the night away and sleep in the next morning. The main restaurant serves a rich and varied buffet of dishes from around the globe, while the two a la carte restaurants offer local specialties and classic comfort foods, all for a delightful family holiday of sea and sun. Located directly beside Varadero Beach, this hotel enjoys a privileged location, just 17 km from the centre of Cárdenas and 62 km from Matanzas. The caves of Bellamar are to be found approximately 50 km away and are well worth a visit. This residence offers high-quality accommodation and attentive service. Recently renovated, it comprises a 4-storey main building and a 2-floor annexe block. Guests can enjoy drinks at the on-site bar and nightclub, while both children and adults can take advantage of the games room. Younger ones may also participate in the kids' club activities and conference facilities are available for corporate travellers. In their leisure time, guests are able to relax beneath the Caribbean sun on Varadero Beach where sun loungers have been laid out ready for use. Further recreation options include 2 swimming pools, a Jacuzzi, a sauna and an in-house gym. This hotel is located directly beside Varadero's beautiful beach and lies approximately 40 km from Juan Gualberto Gómez international airport. The dolphinarium, Chapelín Marina and Varahicacos nature protection area are all located in the near vicinity. Guests can also pay a visit to the dripstone caves of Bellamar that lie only 50 km from the hotel. This all-inclusive hotel offers an array of facilities and is ideal for family holidays. The quality rooms are sure to meet guests' standards, each fully furnished with modern amenities, an en suite bathroom and a balcony or terrace. This establishment is sure to provide its guests with an memorable stay. The hotel complex consists of a main building and villas, and has a lobby with lobby bar, la carte restaurants and a buffet restaurant. Fruit bar, shopping arcade, hairdressers. In the well-kept tropical gardens, there is a large pool area with sun terrace, pool bar and beach club. Amongst the sports available are table tennis, tennis, aerobics, volleyball, billiards, dance classes. Also (subject to availability) catamaran-sailing, snorkeling, and windsurfing. The golf course of Varadero at 1 km distance. Rooms amenities: DVD player, air conditioning, national and satellite TV, telephone, iron and ironing board, in-room coffee maker, mini fridge with supply on arrival, hair dryer, private bathroom with shower and safe. In case of choosing the option of "all inclusive": The All Inclusive-concept includes all meals (breakfast, lunch, dinner, and snacks) and mealtime drinks such as soft drinks, beer, wine, water and alcoholic drinks, all of the local brands. Drinks are served from morning until late evening (approx until 22.-24.00 hrs). Opening times vary between different hotels. In certain hotels, the activities program is also included. The Sol Sirenas Coral Hotel is located in one of the best Varadero’s beach tracks, offers 651 rooms divided in Standard, Standard Sea View, Junior Suite, Suite, Family Suite and Superior Concierge Service typologies. All rooms are equipped with air conditioning, satellite TV, mini-bar, safe, telephone, private bathroom with hairdryer and have sea, gardens or pool views. This hotel includes 8 restaurants, namely of Cuban traditional cuisine, 2 buffets, traditional Italian cuisine, Chinese cuisine, Mediterranean and Mexican food and 8 ideal bars to try a tropical cocktail. It also has 3 outdoor swimming pools, 2 of them with children's and splash areas, direct beach access, meeting rooms, gym with hydro massage, hairdressing and massage, Club House which includes children's entertainment activities, Baby Club, a party room, 2 tennis courts, 1 volley ball court, basketball, mini golf, football and access to various water sports options. Also note the room service, the 24h reception service, Internet access in the lobby, medical services, shops, currency exchange, travel agencies, tours, rent-a-car service, laundry, babysitting and parking. The Arenas Blancas is an All Inclusive resort made up of a collection of attractive buildings and gardens. The center of Varadero is just a few minutes away, offering easy access to well-know restaurants featuring creole and international cuisinesThe all inclusive resort consists of a group of attractive buildings and gardens. The hotel comprises, over 5 floors, 350 standard double rooms, 4 junior suites and 4 wheelchair accessible rooms. Facilities on offer include a lobby area, a safe, a currency exchange desk, a bar, a nightclub, a club house, room service, washing facilities and a kids´ club. A buffet restaurant is available for breakfast, lunchtime and evening meals. The Bello Mar restaurant serves Italian cuisine, the Sol y Arenas restaurant offers guests international dishes and the Criolla gives diners the chance to sample Cuban specialities. All 3 restaurants also offer a service dinner. Surrounded by a delightful tropical garden with palm trees and a pool landscape, the fantastic Be Live Turquesa enjoys an excellent situation directly on the wonderful white sandy beach of Varadero. It is an ideal choice for couples or families with children, as it features various sports facilities and offers for children. The international airport is about 35 km away. It is a 4 stars All Inclusive, with a variety of options for accommodation (hotel, villas and promo room). It is ideal for a holiday with friends or family. Privileged for its central position between old Varadero and modern, near the Golf Club and in front of the best beach area of Varadero. *** The reservation of the villa does not imply the exclusive use of it. This hotel enjoys an enviable setting in the popular tourist area of Varadero The hotel is situated close to the beach and across from the most prominent sports marina in Cuba, Marina Gaviota. The hotel is located in close proximity to the natural beauty and splendour of Varadero Natural Park. This charming beach hotel enjoys a delightful architectural style, greeting guests with the promise of a memorable stay. The hotel comprises beautifully-appointed guest rooms, which offer a peaceful setting in which to relax and unwind. Guests can take advantage of the exemplary dining, leisure and entertainment facilities that this magnificent hotel has to offer. Located in the renowned Varadero resort, on a gorgeous Caribbean beach, 8 kilometers from the city center and 35 minutes from the airport, the Mercure Playa de Oro Hotel offers modern architecture and decor with a system of all-inclusive, 3 restaurants 3 bars, one club, sports activities and evening shows. The hotel has 371 rooms, including 4 adapted for disabled guests, equipped with the necessary amenities for a pleasant stay. In addition, the Mercure Playa de Oro Hotel offers their guests a fitness center, outdoor pool, sauna, massage and private outdoor parking. Its circular lobby with natural light and 3 panoramic levels with views of the artificial lake and beautiful hanging gardens is a main attraction of this five star all inclusive holiday resort located between Las Americas Resort, Melia Las Americas and Sol Palmeras and a few metres from Varadero Golf Club and next to Plaza America Convention Centre. Built in 1930, this hotel captivates its guests with its elegant architecture and its stunning views over the 3.5 km wide Varadero canal. It is just next to the wonderful beach and 15 minutes on foot from the town, while the Juan Gualberto Gómez International Airport is a short 20-minute drive away. The venue is suited for both leisure and conference tourism as it houses modern conference facilities that can accommodate up to 80 guests. But when it comes to relaxing it is at its best - the outdoor pool with children's section is the perfect place for enjoying an afternoon underneath the sizzling Caribbean sun. Massage services and a sauna are available for those who need a little extra pampering, while the active types can enjoy a number of activities ranging from water-skiing, snorkelling, diving, water polo, windsurfing to Spanish dance courses and even catamaran sailing. This hotel is located right by the beach at the entrance to the Balneario peninsula and offers a unique ambience for an unforgettable holiday. Thanks to it's unique location, guests are offered a stunning view of Varadero and experience the memorable sunsets. It is some 30 km to Varadero international airport. The hotel comprises a total of 255 rooms, of which 4 are suites and 251 are doubles, spread over nine floors. Amongst the hotel's facilities count a foyer with a currency exchange facility. In addition, guests are able to take advantage of the café, shops, nightclub, games room, Internet access (for a fee), room service, laundrette (fees apply) as well as a kids club and a car park. Horizontes buffet restaurant offers lunch and evening meals, Dragon de Oro serves international cuisines and La Costa offers Italian dishes. All the rooms include an en suite bathroom with hairdryer, a direct dial telephone, satellite TV, an Internet connection, a minibar, a hire safe and a balcony. Half of the rooms enjoy a sea view. The air conditioning is centrally regulated. The complex features a swimming pool with children's pools as well as a sun terrace with sun loungers and parasols laid out ready for use (fee apply). In addition, guests are invited to relax in the sauna or with a massage (fees apply). Further leisure activities include billiards, table tennis, dancing and diving lessons, tennis, volleyball, aerobics, cycling, minigolf, pedalo hire, catamaran sailing, windsurfing, snorkelling, kayaking, bocce and motorcycling. Further entertainment options include competitions, fashion shows and Cuban nights to take part in or house and club music to dance to.Guests may serve themselves from the buffets at breakfast, lunch and dinner. This charming hotel enjoys a great setting in Varadero. The hotel is located in close proximity to a number of attractions in the area, as well as an array of shopping, dining and entertainment venues. This superb hotel offers guests the perfect setting from which to experience the rich culture and charm of the surroundings. This sublime hotel welcomes guests with warm hospitality and excellent service. The guest rooms are tastefully appointed, offering a relaxing setting in which to completely unwind at the end of the day. The hotel affords a wide range of excellent facilities, meeting the needs of every type of traveller, and assuring them of an enjoyable stay. The Barceló Arenas Blancas Resort enjoys a terrific seafront setting on the popular Playa Azul beach yet only 200 m from the city centre of Varadero in Cuba. Situated in a resort with two hotels, the 4 Star Barceló Arenas Blancas Resort is a haven for families and offers a wide range of sports and activities characterised by the excellent Barceló All Inclusive programme, which allows all ages to enjoy all the services and facilities of this magnificent 4-Star hotel. The focus is on your complete holiday enjoyment through choice: 10 restaurants, 11 bars, 3 swimming pools, a glorious beach, and professionally hosted daytime activities and evening entertainment shows. All nestled in attractive gardens with the ocean lapping close by. 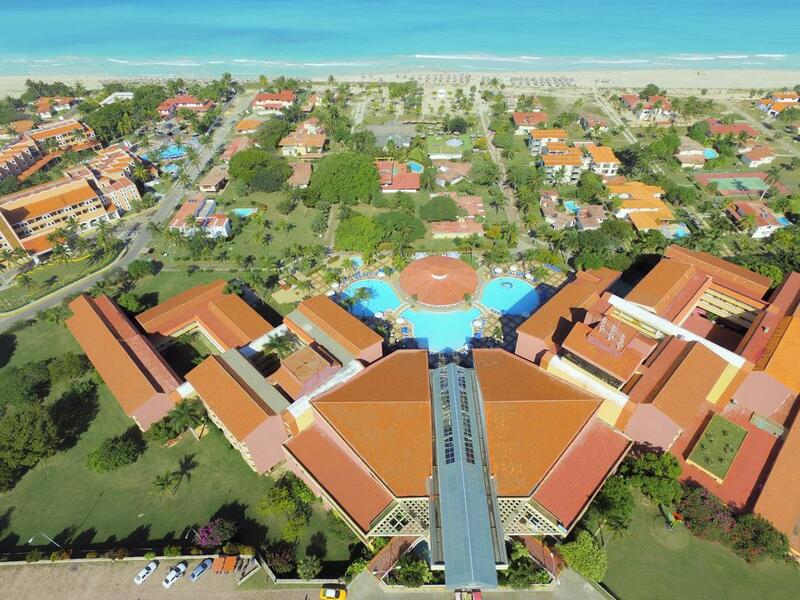 Book into the impressive 4-star Barceló Arenas Blancas Resort at Varadero city where you Stay at One and Play at Two! Getting to the Hotel: The Hotel is 25 km from Varadero Juan Gualberto Gomez International Airport. Local Tips: Barcelo Arenas Blancas Resort is perfectly positioned for visits to the Varadero Golf Course, the town of Varadero, and the city of Matanzas, 55 km from the hotel. The Hotel is booked as All Inclusive accommodation. The Barcelo Arenas Blancas has a super choice of 4 buffet restaurants with new areas of show cooking and 6 a la carte restaurants serving a variety of cuisines including international dishes, traditional Cuban, Italian, Spanish, Caribbean seafood, oriental and Mexican; there are 11 bars which include pool snack bars, beach bar, a piano bar, disco bar and Latin karaoke bar; a professional animation team host an evening entertainment programme in different locations around the resort. Activities: 3 outdoor swimming pools, 2 Jacuzzis, sun terraces and shaded areas with loungers, parasols and a towel service; a fully-equipped air-conditioned fitness centre (9am-5pm); sauna, beauty salon, hairdresser and massage service available (charges); onsite activities include: 3 tennis courts, basketball, Petanque, archery, table tennis, exercise classes, cycling (charge), shooting range (charge), a range of pool sports, and beach sports which include snorkelling, beach volleyball, windsurfing, beach tennis, catamaran sailing, beach football, kayaking and pedal boats. A professional entertainment team supervise numerous daily activities in different areas of the resort. Varadero golf course is 1.5km away and access to scuba diving facility nearby with certification courses (charges). Diving introductory lessons 3 times a week. 24 hour Reception Services, housekeeping, currency exchange, 24, express check-in/out service, Wi-Fi Internet (only in the lobby area) (charges), telephone and fax service (charges), 24 hour internet room, public relations office, tourist information office, post office, medical service (9am-5pm, Mon-Sat: charges), luggage room, car and motorbike rental, security service, wedding events hosted in Gazebo facing the beach, parking available, mini supermarket, boutique and facilities for guests with disabilities. The Barcelo Arenas Blancas Resort features newly renovated Superior guestrooms and Suites with a warm inviting Caribbean-style decor that has been fully refurbished with soft pastel interiors, patterned full-length drapes and bed covers add subtle complementing colours, smart furnishings set on cool tiled flooring and modern amenities take care of your comfort; features include a private furnished balcony with sea or garden view, air-conditioning, bathroom with bathtub, shower and hair dryer, King size bed or double beds, Satellite TV, telephone, writing desk and chair, mini fridge, safe box, iron and board and coffee machine. Adapted rooms are available to guests with restricted mobility. Suites are larger and are ideal for families with wonderful views of the sea the pool or the garden. This all-inclusive 135-room resort in Varadero (Cuba) is a collection of attractive buildings set in beautiful gardens that gives guests excellent value for money. Is the atmosphere is relaxed and laid-back, it is ideal for couples and families who are looking for the perfect vacation. It is situated on a beachfront location and the airport is just 25 minutes from the airport by car. Varadero city centre is just a 5-minute walk from the entrance. The hotel offers a buffet breakfast, an on-site restaurant for lunch and snacks, as well as an à la carte menu. Snorkelling, sailing and windsurfing are among the water sports on offer in the vicinity, and other facilities include tennis courts, a fitness centre and massages. The air-conditioned rooms are equipped with satellite TV, an in-room safe, mini-fridge and a bathroom with tub (maximum occupancy 3 persons). This charming hotel enjoys a peaceful setting in Varadero. The hotel is nestled amidst the coffee plantations of the area, lying close to Mangon Lake. Guests can explore the charm and beauty of the area, as well as the nearby Acuavida Spa Thalasso. The hotel offers guests the perfect setting in which to escape the bustle of daily life. This delightful hotel enjoys a traditional style, exuding a sense of peace and serenity. The guest rooms are tastefully appointed, offering a haven in which to relax and unwind at the end of the day. Guests are assured of a memorable stay at this wonderful hotel. The BelleVue Palma Real All Inclusive is a great hotel nestled in the heart of Varadero very close to the bustling area of shopping sites and nightlife possibilities. Guests will be able to reach the beachfront on foot, since it is only 250 metres from the hotel. Park Josone is within 500 m and the town of Matanzas is only 32 km from the hotel. This elegant hotel features well fitted rooms and surroundings inspired by pure Cuban style combined with a warn service to make the best of holidays. This hotel enjoys an idyllic setting, nestled amidst a white sandy beach and turquoise sea, as well as luscious gardens. Guests will feel as though they are a world away, whilst staying at this unique establishment. Within a short distance of this hotel, lie a host of shopping, entertainment and dining venues, where guests can relax and unwind. Greeting guests with a serene ambience and stunning setting, this hotel presents a tropically-inspired architecture, complemented by the elegant, natural surroundings of the interior. The guest rooms are sumptuously appointed, featuring neutral and pastel tones, embodying a sense of relaxation and rejuvenation. The hotel offers an array of exciting facilities, catering to the needs of every type of traveller. The modern hotel complex is set in a fantastic location directly by Varadero beach, surrounded by lush tropical greenery. The nearest nightclub is 1 km away and the Delphinarium is 7 km away. The centre of Varadero is roughly 18 km away. Varadero international airport is 50 km away. Opened in 2004, the hotel comprises a total of 386 rooms spread over 11 buildings. The hotel offers a lobby with a 24-hour reception and a currency exchange desk. In addition to this, there are a number of shops, dining and entertainment options in the premises. Further amenities include conference facilities, room and laundry services. The rooms all come fully-equipped as standard featuring a satellite TV, Internet access and a minibar. Moreover, all rooms come with either a balcony or terrace. The air conditioning is individually adjustable. Located in one of the most beautiful areas of the Hicacos Peninsula, next to its elegant rooms, careful attention to detail and magnificent cuisine, make it the ideal choice for romantic getaways and business trips and families. Located on one of the best parts of Varadero Beach with varied Cuban and international dining options Near other important travel destinations such as Havana, Cienfuegos and Cayo Santa Maria. International Airport only 35km away Exclusive services on The Level and The Level Adults Only floors with exclusive facilities and amenities. Wellness experiences at the luxurious YHI Spa with infinity pool, beauty salon, Fitness Centre, sports courts and Water Sports Club. Modern Convention Centre and facilities for events, weddings and honeymoons. Miniclub for children Wi-Fi All Inclusive luxury Disconnect in this magnificent resort on the best beach in Varadero. A spectacular hotel with panoramic lifts, shopping gallery, swimming pools and beautiful tropical gardens. Cuisine and exclusive services Discover our impressive cuisine, relax in luxurious spaces such as YHI Spa with infinity pool, and access to superior services at The Level. Events A specialist team will help organise your meeting or family celebrations in magnificent settings such as the modern Convention Centre or romantic wedding venues.